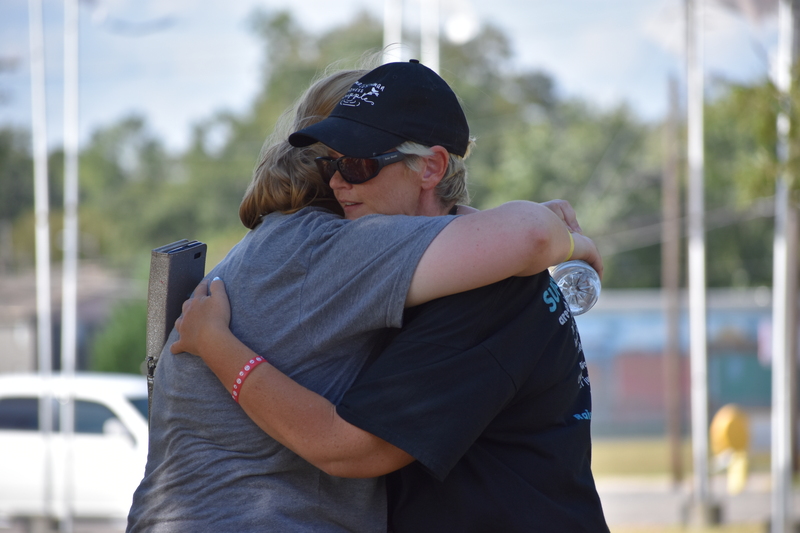 CULLMAN – On Saturday afternoon, despite stiff competition from college football and local events like Bernard Blues and BBQ, Karma in Cullman still drew a small crowd to Depot Park for its second annual Walk of Hope suicide prevention awareness event. Volunteers provided food and drinks and did crafts and face painting for kids. Representatives of WellStone Behavioral Health were on hand to talk and distribute information on mental health, and LifeSouth held a blood drive in conjunction with the event. Karma Founder Rachel Bryant sent out a special thanks to Robert Spicer of BlueyOne DJ for the music, and Owlette from “PJ Mask” for stopping by courtesy of Mobile Party Characters. Bryant herself survived an attempt and has suffered loss in her family and is candid about her experiences. “I’m very open about it,” said Bryant, “because I want others to know that they’re not alone. Everyone goes through a depressed state every now and then; that’s just a natural instinct. But it’s when you can’t get out of it that it becomes dangerous. Bryant also credited her children with helping her along the way. Bryant is excited about her organization taking part in the season’s last 2nd Friday celebration on First Avenue this coming Friday (Sept. 14). Karma will be doing games, and in keeping with that event’s planned carnival theme, volunteers are going to have a little dress-up fun and come as sideshow characters like a bearded lady and fortune teller. On Sept. 29, visitors to “The Haunt at Camp Liberty” will get a discount on admission by bringing toys that Karma will give to area kids in need. Karma will host a community Thanksgiving dinner in November and is planning for a big Christmas celebration. Karma offers homeless care kits with food items and water for three meals, along with personal care products packaged for men or women. The bags can be kept in a car trunk and given out when a need is found. Those interested can visit the Karma office to get bags. Bryant said Karma’s food bank is currently low and could use donations of non-perishable food items. With winter coming on, the organization is taking donations of blankets to be distributed to the homeless and those in need. Karma is seeking new and gently used toys to give to children this Christmas. Karma is a 501(c)(3) nonprofit, and tax-deductible monetary donations are always welcome. For more information about Karma, or to get involved, stop by its office at 785 Alabama Highway 157 in Cullman, call 256-735-3942 or visit www.facebook.com/groups/1437544579798507/. In an article published earlier this week, The Tribune listed links to sites with information on recognizing and responding to warning signs of depression and self-harm, along with contact information for numerous organizations both national and local that can help. See www.cullmantribune.com/articles/2018/09/08/igniting-hope-local-ministries-leaders-come-together-prayer-service-start.